Arriving at Four Seasons Sayan: the main hotel building is clinging to the side of the steep river valley, directly beneath the the lily pond that you can see behind me. I've been waiting to post about this extraordinary place because I came here to write about it for the Daily Mail, and I thought I should wait until that piece emerged in print, which it did yesterday. As is always the way, the piece was cut back a good deal, particularly all the detail about the spa, but hey - I can put all that here, instead. So here's me arriving at the Four Seasons hotel at Sayan, in the jungly central uplands of Bali, very close to Ubud, the town that has become a big focus for artists, yogis and latter-day hippies, especially since the film of Eat Pray Love came out. 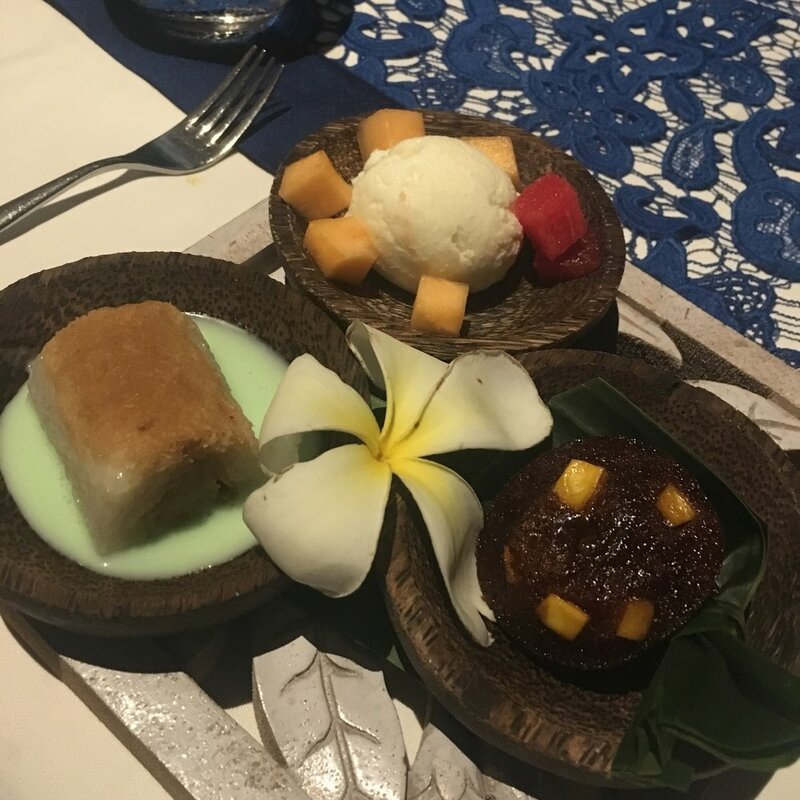 And where did Julia Roberts stay while filming Eat Pray Love? At the Four Seasons! If you're wondering where exactly the hotel is... it is directly beneath that huge lily pond behind me, which seems to be suspended in mid-air. The pic below shows what the entrance looks like from the air. Spectacular is barely a big enough word for it. The Four Seasons Sayan sits below the circular lily pond. Guests reach the hotel by crossing the treetop-height walkway. And how is the hotel beneath the lily pond? Because it is clinging to the very steep side of the hill that tumbles down toward the river Ayung in the bottom of the valley, like a retro James-Bond-baddie's lair, out of sight beneath that canopy of tall palms. Stairs bring you down to the open-sided reception area, a sweep of a semi-circle overlooking the valley and another floor down from reception is the open-sided dining room, below. From the main hotel building, paths snake along through the gardens leading to the private villas, each of which has a private infinity pool and views of the jungle or the river. This was our spot, below. The villas, as you would expect, are luxuriously appointed. Look at that beautiful carved screen behind the bed, below. A short walk from our villa brought us down to the yoga 'shala', a beautiful open-sided structure looking out over the hotel's own rice paddies. I was hugely intrigued by the yoga parachutes suspended from beams in the shala. They're used for aeriel yoga, and of course I had to try it. There are classes in this every morning - but the morning I went, no one else showed up which meant that I had a one-to-one hour learning the basics and trying out a variety of suspended positions. Hanging upside down in the yoga parachutes felt very freeing for my spine and was immensely good fun. I seem to remember a lot of laughter during the session. The parachutes are also used as cosy pods for what Ibu Fera, who runs the wellness program at Sayan, describes as a 'sacred nap'. She was a Buddhist nun before coming to work at Sayan, and with guests cocooned in the canopies, she sings and tells stories about the life of the Buddha. Tucked into our chutes, swaying into the breeze, listening to her lovely voice and the croaking frogs and whirring cicadas in the surrounding jungle, I fell asleep before she had got very far. What a treat. Here I am with Ibu Fera, who runs the wellness program at Sayan. And then there's the spa. Well, there are two spas here - one in the main building, which is for basics like manicures and pedicures and facials, and the Sacred River spa, with three separate treatment areas set among lily ponds. Matthew (my husband) and I were booked in for a chakra balancing ritual. He's a bit of a spa-phobe and tried to wriggle out of it when he found it was three hours long, but I told him it was vital for research purposes that he attended. We started off with a very thorough scrub treatment. First, we were rubbed down with Himalayan salt, then runny honey was drizzled over the salt and rubbed in, then milk was added to make the whole lot softer. It sounds peculiar, but it felt wonderful - particularly because this whole mess was then rinsed off with a Vichy shower. I had no idea that a Vichy shower needs a complex piece of equipment - a long pipe suspended from the ceiling of the treatment room, which covers the length of the treatment bed and rains water down on you from its whole length as you lie, with your head wrapped in a towel, face down on the massage bed. So you stay put as the water hammers over you, and goes on pouring down for ten minutes, wondering just a little whether all this water that's sluicing off the treatment bed is going to soak that head-towel and turn it into the spa equivalent of waterboarding (if James Bond were here, and this were the baddie's lair, that would surely be how the treatment turned out). But we emerged, rinsed clean and with dry heads, and were sent giggling to lounge in a petal-strewn, 5ft square stone bath while the spa ladies mopped down the treatment room and got it ready for our massages. What bliss. 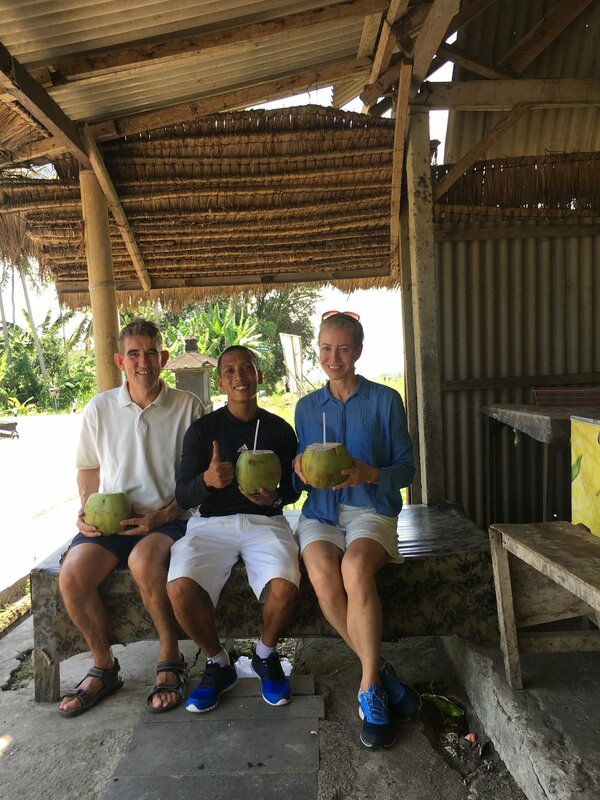 Fresh coconut water, which tastes divine. 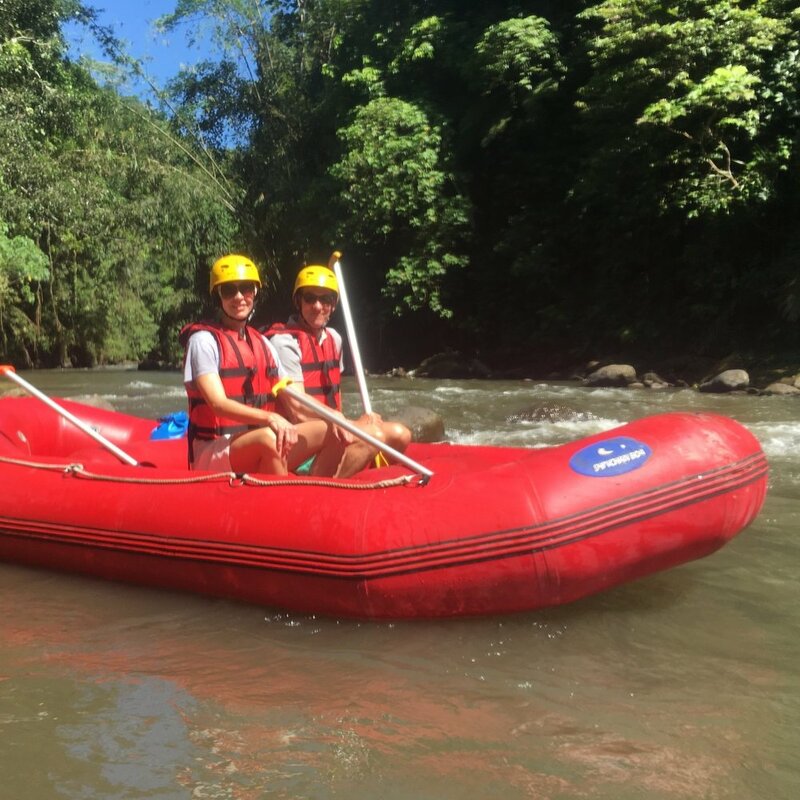 We also went white-water rafting down the Ayung river. By late October, at the very end of the dry season, the river is low so thankfully this was a very gentle cruise downstream. And we explored the countryside in the hills outside Ubud by bicycle. Yes, it was really hot, but if you cycle slowly, you get enough breeze to keep you cool (and with that strong sun, I wasn't going to risk a short-sleeved shirt). Cycling turned out to be the most brilliant way to see the countryside and the many temples in the villages. ...as well as getting a feel for what the countryside looked like (lots of rice paddies. It is so warm and humid here, that farmers can grow four crops of rice a year). Matthew, Agus and I, nearing the end of our 20km cycle.